Shhh, don't let the children know that its not an army elves at the North Pole magically making presents to place under the Christmas tree this year. 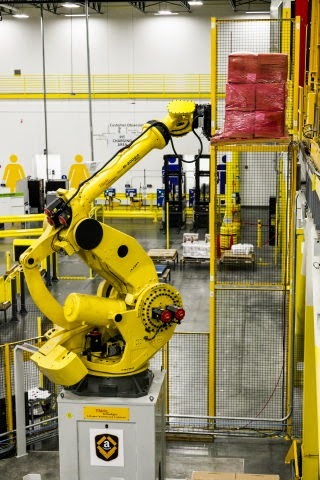 Instead, it is a fleet of tireless robots at Amazon that are fulfilling its online orders. The e-commerce giant gave the public a glimpse into its eighth generation fulfillment center on Cyber Monday. Ten of these new generation fulfillment centers currently operate across the U.S. with more than 15,000 Kiva robots humming along without ever requiring a lunch break. Despite this automation, robots have not entirely replaced a human workforce. Amazon recently announced it will hire 80,000 seasonal employees to fulfill customer orders this holiday season, a 14 percent increase over last year. The company expects that thousands of those employees will stay on in regular, full-time roles. Amazon's plans to continue to hire humans should come as welcome news to Florida Governor Rick Scott's Office. Last year, Amazon proposed to open a distribution warehouse that would create more than 3,000 full time jobs with benefits in Florida by the end of 2016 in exchange for tax breaks.